The use of oligonucleotides as therapeutic agents is of great interest, particularly when it comes to siRNA and antisense oligonucleotides. However, the difficulty of targeting the right organ and achieving efficient delivery to the cell remains a problem. There is much research activity directed at addressing these issues, employing solutions such as modification of the oligonucleotide backbone or the use of a delivery agent attached to the oligonucleotide. In the case of the latter, various molecules including lipids, cationic lipids, cell-penetrating peptides and cell-targeting ligands have been reported to improve cell delivery by virtue of their hydrophobicity. This assists in their interaction with the hydrophobic environment of the cell membrane lipid bi-layer. While these approaches have all been shown to enhance delivery, and in some cases even improve cell targeting, there are often associated challenges. Principally, even with successful delivery, there is still a need to release the oligonucleotide from the delivery agent once it has entered the cell to ensure efficient antisense activity. One method of achieving this is the use of a cleavable disulphide bridge between the delivery agent and the oligonucleotide. However, when used in vivo there is the potential for toxic effects, since the delivery agents are frequently not recognized by the cells. The use of vitamins as delivery agents has been shown to have potential in resolving this issue. Although vitamins such as tocopherol are not produced by the target cells, they are recognized by them, thus avoiding the issues of toxicity. They are also thought to be internalized by cells only after interaction with a binding protein, opening up the potential to target specific cell types using the technique. Oligonucleotides modified with tocopherol via a disulphide-bridge are excellent candidates for the efficient delivery of factors such as therapeutic drugs directly into living cells. To make it easy to synthesize such custom oligonucleotides, Link Technologies has developed a range of tocopherol-based reagents. These simplify the incorporation of tocopherol into the 5´-end of an oligonucleotide and can be easily used with other modifications. Although the direct incorporation of tocopherol into a therapeutic oligonucleotide should efficiently mediate its delivery into a cell, its hydrophobic nature might inhibit the final function of the oligonucleotide once inside the cell. To this end, we synthesized oligonucleotides conjugated to tocopherol via a cleavable disulphide-bridge. After delivery to the cell, the tocopherol could be easily removed from the oligonucleotide by breaking the disulphide bridge, leaving the oligonucleotide free to carry out its therapeutic function. To demonstrate the feasibility of this approach, we constructed a cell delivery model system in which a hydrophobic cartridge takes the place of the cell membrane. Oligonucleotides were synthesized using standard phosphoramidite chemistry, introducing a disulphide bridge linker followed by tocopherol incorporation at the 5´ end. The resulting crude oligonucleotide has the general structure tocopherol-S-S-oligo. After synthesis, the oligonucleotide was cleaved and deprotected, then immediately loaded onto a standard purification cartridge (Figure 1). The purification method mimics what we would expect to happen in cell delivery, in that the modified oligonucleotide can be “delivered” to the cartridge and then the active molecule released via cleavage of the S-S bond, retaining the delivery agent (tocopherol) on the cartridge. Using thiol-modified oligonucleotides conjugated to tocopherol as an example, we have generated data indicating that tocopherol successfully mediates attachment of the conjugate to the cartridge, and that the oligonucleotide can be released at a high level of purity following cleavage of the disulphide bridge. This data indicates that the oligonucleotide can be easily released from the tocopherol delivery agent with sufficient efficiency and purity to accurately carry out its therapeutic function. Figure 1. Cartridge purification method using the hydrophobic nature of tocopherol (amidite shown). Interestingly, the purity of the oligonucleotides obtained using our cartridge model system was better than that provided by standard cartridge purification. This prompted us to extend our investigation and delve deeper into our data, allowing us to explore whether tocopherol conjugation could be used as an efficient method of oligonucleotide purification. 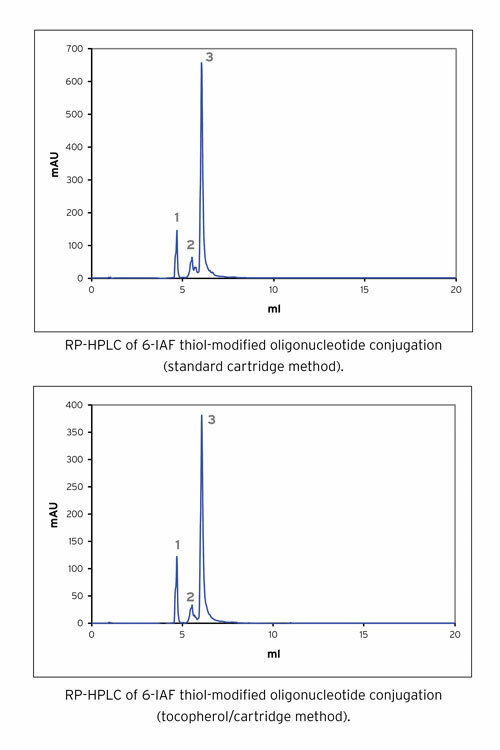 Examples of the IE-HPLC analysis of the resultant oligonucleotides are shown in Figure 2. Specifically, expansion around the main peak illustrates synthesis failures. Although the standard purification method gives a relatively clean product when compared with the crude oligonucleotide, the tocopherol-based method clearly shows fewer failures. In order to demonstrate the functionality of the pure oligonucleotide, conjugation of thiol-labeled oligonucleotides (prepared with and without tocopherol) was carried out using 6-iodofluorescein (6-IAF), which is a common dye used in many detection applications. For example, this is often used to incorporate a fluorescein moiety into oligonucleotides used for detection. We have found that as the purity of the thiol-modified oligonucleotide increases, the efficiency of conjugation also increases. Use of the crude oligonucleotide gave ~80% labeling, whereas standard cartridge purification gave ~86% labeling and Link Technologies’ tocopherol/cartridge method gave >90% labeling (Figure 3). This clearly shows that the use of oligonucleotides purified using tocopherol results in a more efficient conjugation than either standard cartridge purification or using the oligonucleotide in its crude form. We have also demonstrated that the specific activity of the thiol-modified oligonucleotide is not adversely affected by the use of tocopherol. While the method has been described for the purification of thiol-modified oligonucleotides, this can also be applied to other modified oligonucleotides in those cases where it is possible to use a cleavable linker. Figure 2. 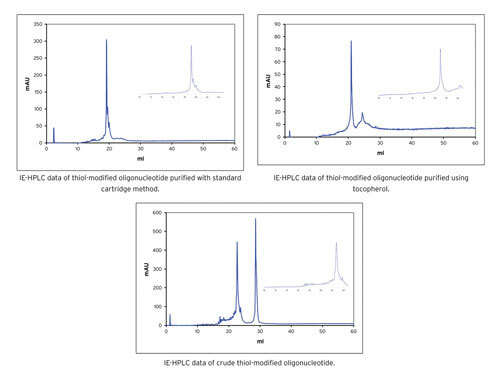 IE-HPLC analysis of thiol-modified oligonucleotide crude, purified by standard cartridge and by tocopherol/cartridge methods. 5´-Tocopherol modified oligonucleotide precursors produced by Link Technologies have proven to be versatile products for use in the synthesis of oligonucleotides with varied applications in drug discovery. Tocopherol is easily incorporated, with spacers if required, to the 5´-end of an oligonucleotide as a nontoxic cell delivery agent for therapeutic use. Its hydrophobic nature can also be utilized to facilitate preparation of highly pure thiol-modified (and potentially other) oligonucleotides for downstream applications such as bioconjugations, where purity is directly correlated with application efficiency. As a supplier of specialized reagents for oligonucleotide synthesis, Link Technologies offers everything required to synthesize custom oligonucleotides modified with tocopherol, either for therapeutic use or as a means of increasing the purity of the final product. Figure 3. 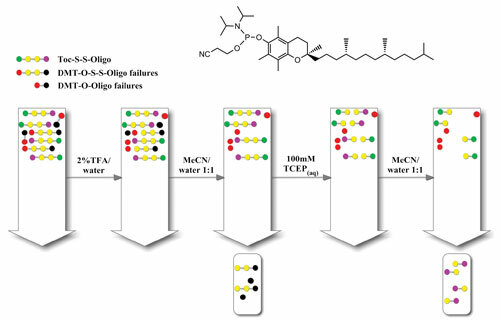 RP-HPLC analysis of conjugation reactions of thiol-modified oligonucleotides to 6-IAF, showing (1) unreacted 6-IAF, (2) failures, and (3) product. Catherine McKeen, Ph.D. (catherine@linktech.co.uk), is a product manager at Link Technologies. Web: www.linktech.co.uk.